Inlife 7 gms Branched Chain Amino Acid (BCAA) Formula: Engineered with the optimal 2:1:1 ratio of L-Leucine, L-Isoleucine and L-Valine. This potent branched chain formula helps to rebuild lean muscle and reduce soreness after a workout. 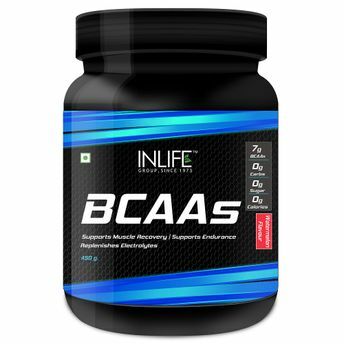 This formula also contains added L-Glutamine, L-Citrulline Malate, Vitamin B6 with Electrolytes and will deliver noticeable results in your bodybuilding, crossfit or powerlifting training. The most effective and safe formulation of trusted ingredients carefully processed and manufactured in a GMP certified manufacturing facility, it minimizes tissue damage that normally occurs after intense strength training, so you can make the most out of your workouts. The essential amino acids leucine, isoleucine, and valine in it help for faster absorption, which translates to faster post-workout recovery and better performance results. Electrolytes is for hydration to recover from a strenuous workout and help fight muscle breakdown during recovery.